Stop Veolia Union Busting! Hands Off Boston School Bus Union 5! STOP VEOLIA UNION BUSTING! HANDS OFF THE BOSTON SCHOOL BUS UNION 5! 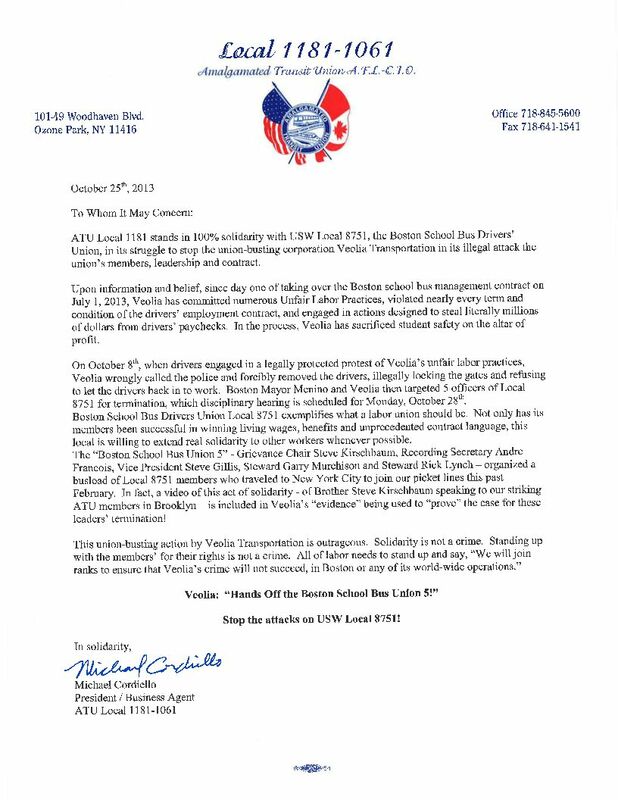 Stand in Solidarity with USW Local 8751, the Boston School Bus Drivers’ Union, in its struggle to stop the union-busting corporation Veolia Transportation in its illegal attack on the union’s members, leadership and contract. On Monday, Oct. 28th, Veolia has planned a disciplinary hearing, threatening to terminate 5 of USW Local 8751’s elected officers. 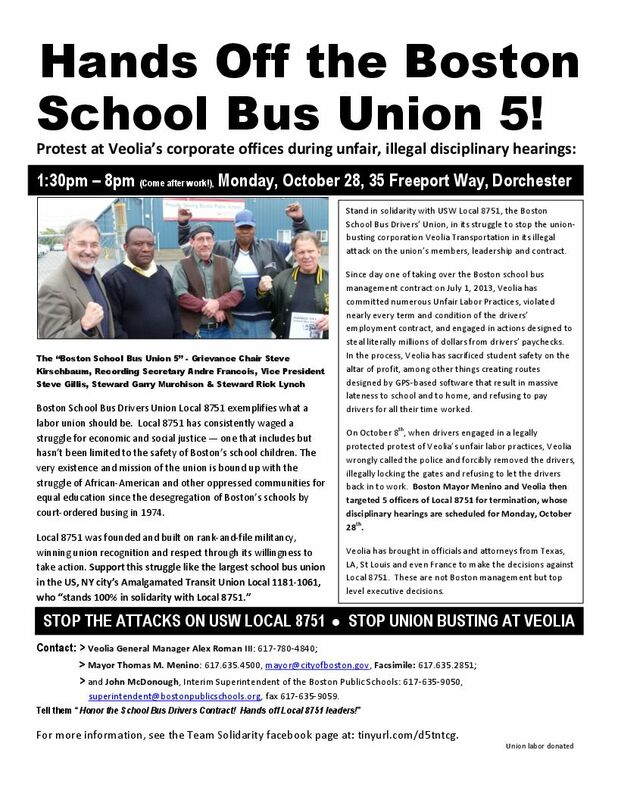 In Boston, join the protest at Veolia in Dorchester from 1:30 PM on to demand, “Veolia: Hands Off the School Bus Union 5!” – Grievance Chair Steve Kirschbaum, Recording Secretary Andre Francois, Vice President Steve Gillis, Steward Garry Murchison and Steward Rick Lynch. Since day one of taking over the Boston school bus management contract on July 1, 2013, Veolia has committed numerous Unfair Labor Practices, violated nearly every term and condition of the drivers’ employment contract, and engaged in actions designed to steal literally millions of dollars from drivers’ paychecks. In the process, Veolia has sacrificed student safety on the altar of profit, among other things creating routes designed by GPS-based software that result in massive lateness to school and to home, and refusing to pay drivers for all their time worked. On October 8th, when drivers engaged in a legally protected protest of Veolia’s unfair labor practices, Veolia wrongly called the police and forcibly removed the drivers, illegally locking the gates and refusing to let the drivers back in to work. Boston Mayor Menino and Veolia then targeted 5 officers of Local 8751 for termination, which disciplinary hearing is scheduled for Monday, October 28th. Boston School Bus Drivers Union Local 8751 exemplifies what a labor union should be. Not only has its members been successful in winning living wages, benefits and unprecedented contract language, this local is willing to extend real solidarity to other workers whenever possible. This union has fought racism, sexism, anti-LGBTQ bigotry, every war since the 1970's and practiced solidarity with all workers struggles inside and outside of union organizations. Stop the attacks on USW Local 8751! and John McDonough, Interim Superintendent of the Boston Public Schools 617-635-9050, superintendent@bostonpublicschools.org, fax 617-635-9059. 2. Hold a solidarity activity, if possible at a Veolia location near you, or. Come to Boston and Rally outside Veolia’s corporate offices during the disciplinary hearings against the 5! 4. Send your endorsement of the Committee to Defend the School Bus Union 5 to schoolbus5@teamsolidarity.org..